Environmentally friendly adventures focused on uncovering the true beauty of America by biking, hiking or both. Biking in Arches is only allowed on designated roads. The Scenic Drive is a popular 22 mile road biking route. Willow Springs Road is an 18 mile round trip beginning at Utah 191. The Windows Section is 12 miles from the Visitors Center. Klondike Bluffs is 10.7 miles one way. 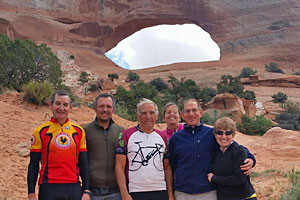 No single track bike paths exist within Arches National Park, but bikers can still use vehicle friendly roadways to tour past the sandstone monoliths that make the region famous. While riding in Arches, remember to stay on the roads, ride in single file, and stick to the edge of your lane. There is no shoulder or bike lane and traffic is often heavy and moving fast. Cruise 18 miles from Arches National Park Visitor’s Center to the Devil’s Garden Campground. Pass by Park Avenue and Courthouse Tower, or park your bike for a 1 mile hike to take photos of Balanced Rock and Double Arch from The Windows. Turn your cruiser into a mountain bike on this route beginning at Utah 191. Ride 9 miles up Willow Springs Road to end at Balanced Rock or make it a 2.5 hour round trip. 10.7 miles one way, this is a relatively easy route for mountain bikers or 4 wheel drive vehicles, but be prepared to hike the last mile to view the magnificent Klondike Bluffs and Marching Man Pillars. Located in the north end of Arches, this road is sometimes impassable or temporarily closed during wet weather. Watch for washboards and deep sand. 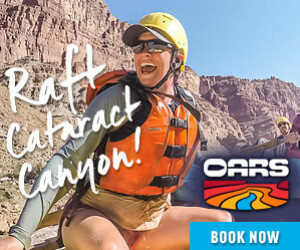 While Arches National Park does have some roadways that are accessible by bike, Moab, Utah, just five miles away, has world class trails and guided tours that are fun for the whole family and for bikers of all levels.